Structural design is the science of studying the Mechanics of a structure. Designing the skeleton of a building determines the real strength of the structure. If the structure is externally beautiful and internally weak, it results into dramatic structural failure. In this article, we are going to discuss in detail about the “Various Methods of Structural Design”. 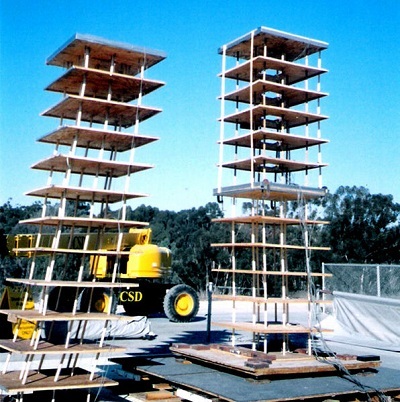 All parts of a structural steel framework of a structure shall be capable of sustaining the most adverse combination of dead loads, the prescribed super imposed roof and floor loads, wind loads, seismic forces where applicable, and any other forces or loads to which the building maybe reasonably subjected without exceeding the permissible stresses. The above mentioned methods are used as per their requirement. For example, Simple design Method is used where the end connections of the members in the structure do not develop restraint moments that would affect the structure. Lets discuss the Simple Design Method in detail. This method is based on elastic theory and applies to structures in which the end connections between members are such that they will not develop restraint moments adversely affecting the members and the structure as a whole and in consequence the structure may, for the purpose of design, be assumed to be pin jointed. Simply supported beams are used. All connections of beams, girders, or trusses are virtually flexible and are proportioned for the reaction shears applied at the appropriate eccentricity. The members in compression are subjected to forces applied at the appropriate eccentricities. The members in tension are subjected to longitudinal forces applied over the net area of the section. The plane sections normal to the axis remain plane after bending. The stress-strain relationship for steel is linear. These assumptions are to be essentially followed for the successful implementation of the Simple Design Method. Let us now discuss “Semi-rigid Design Method”. Semi-rigid Design Method permits a reduction in maximum bending moment in beams suitably connected to their supports as compared to the Simple Design Method. In case of triangulated frames, it permits rotation account being taken of the rigidity of the connections and the moment of interaction of members. In cases, where this method of design is employed, it is ensured that the assumed partial fixity is available and calculations based on general or particular experimental evidence shall be made to show that the stresses in any part of the structure are not in excess of those laid down in IS: 800-1984. The assumptions in this method of design are different from that of the Simple Design Method and Semi-rigid Design Method. As the name suggests, this method involves assumption of the end connections being fully rigid and capable of transmitting moments and shears. If the method is used in convenient cases, it also gives economy in the weight of steel and saves construction costs. The end connections of the members of the frame shall have sufficient rigidity to hold virtually unchanged original angles between such members and the members they connect. The design should be based on accurate methods of elastic analysis and calculated stresses shall not exceed permissible stresses. Plastic Design Method is a recently developed method of design as in it evolved in 1935 but even today there are many difficulties and problems in using this method and engineers are trying to solve it. One of the drawback that the structural usefulness of the material is limited upto the ultimate load. This method has its main application in the analysis and design of statically indeterminate frame structures. This is the most economical method of design as compared to Simple Design Method, Semi-rigid Method and Fully rigid Design Method. Structure provides striking economy as regards to the weight of the steel. Technology is advancing and so is the technology of construction. Various different construction techniques have been devised for better and superior constructions. The methods that we discussed in the articles are the major design methods which are frequently in practice. i’m a student engingeer with my majors in civil and environmental engineering. I will like to be informed on recent and knolegable developments in the word of engineering. i need to design a steel balcony how can i do it into existing building? please suggest to column footing design for 50 MT crane capacity with 15 mtrs. height building with column center to center 7.50 mtrs.